990 Classic Invitational 14.1 . January 1990 . Rochester, N.Y.
At the start of the 1990 Classic Invitational 14.1 Championship final between Jim Rempe and Mike Sigel, a few hundred fans packed themselves into the stands surrounding the main table at Classic Billiards. In Sigel's backyard of Rochester, N.Y., two of the most explosive straight-pool players of the last 30 years were set to square off in a race-to-200. Rempe coaxed fans back into the stands with 185 unanswered points. After just a few innings, only a few dozen sweators speckled the bleachers. After Rempe's opening break, Sigel rattled off a run of 137 and worked his way to a 195-15 lead. Fans wandered away from the match, returning to their own tables in the poolhall's front room. "I had to break, and he ran 137 balls from the break on me," Rempe said, recalling the fantastic final 18 years later. "I was thinking, 'Wow, this guy's going to run a hundred-and-something every time we play?'" Rempe was all too familiar with Sigel's mastery of straight pool. A few weeks before at the I.W. Harper U.S. Open in Chicago, Sigel had run 150-and-out on him. Then, earlier in the Classic Invitational, Sigel dropped a run of 89 on Rempe in a dominant 150-8 win in the hot-seat match. But in the final, only five balls from a lopsided loss to Sigel, King James remained supremely confident, knowing he just needed a chance to get to the table. 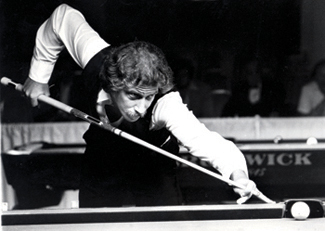 "I was running a lot of balls at the time, and we'd just come from Chicago, so I was in straight-pool stroke," he said. "I was running a lot of hundreds, so I knew what I could do. It was just a matter of getting to the table." Rempe got his turn, and promptly fired off a run of 70. The two exchanged safeties, and Rempe put in five more. Down 195-90, he really got rolling. One rack cleared, then another, and another. All the while, Sigel held the tortuous duty of racking for his opponent-turned-juggernaut. "He was doing everything he could to try and shark me," Rempe remembered with a chuckle. "But I was playing too good." And as the 180-ball lead dwindled, fans starting reappearing in the stands. "It was really funny," Rempe said. "By the time I got back into the match, the stands were full again. It was like something out of Alfred Hitchcock's 'The Birds.' People just kept coming back." Rempe finished off his title-clinching run of 110, stealing what appeared to be a coronation of the hometown boy in Sigel. In a bit of revenge for that 150-and-out in Chicago, Rempe reeled off 185 unanswered for one of the greatest comebacks in straight-pool history - and one of the greatest finals of the last 30 years. "All the straight pool tournaments, it was all the same players," Rempe said. "It didn't matter what title it was, a tournament was a tournament. But I know he wanted to win that one; it was his hometown tournament."